Our reply has since been published on ST on 15 October 2012. It can be found here. 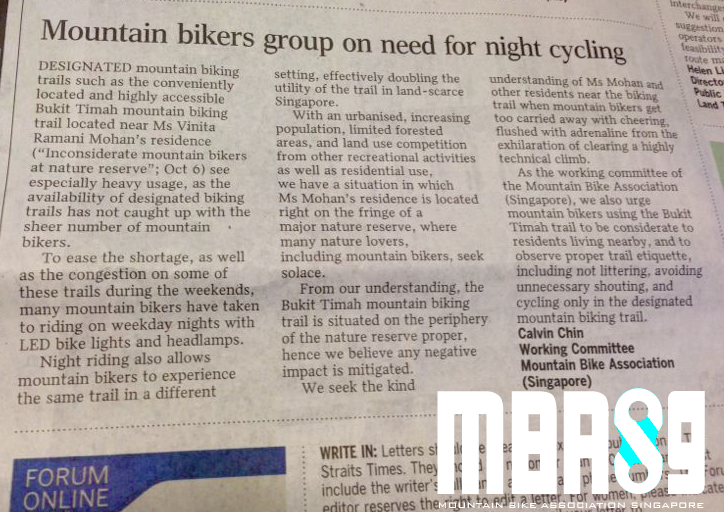 We refer to Ms Vinita Ramani Mohan's letter (Inconsiderate mountain bikers at nature reserve) published on Oct 6, 2012. Mountain biking, and cycling in general, has been thriving both as a sport as well as a recreational activity in recent years, and we now have a thriving community of mountain bikers estimated in the thousands. Designated mountain biking trails such as the conveniently located and highly accessible Bukit Timah mountain biking trail located near Ms Mohan's residence sees especially heavy usage, as the availability of designated biking trails has not caught up with the sheer number of mountain bikers. To ease the shortage of designated riding trails, as well as the congestion on some of these trails during the weekends, mountain bikers are an ingenious lot and many have taken to riding on weekday nights with LED bike lights and head lamps. 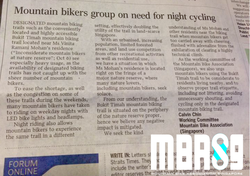 Night riding also allows mountain bikers to experience the same trail in a different setting, effectively doubling the utility of that same trail in land scarce Singapore. With a 100% urbanised, increasing population, limited forested areas, and land use competition from other recreational activities as well as residential use, we have a uniquely Singapore situation where Ms Mohan's residence is located right on the fringe of a major nature reserve, where many nature lovers including mountain bikers seek solace. From our understanding, the Bt Timah mountain biking trail is situated on the peripheral of the nature reserve proper, hence we believe any negative impact is mitigated otherwise I am sure the authorities will not approve the building of condominiums or residences along the same peripheral. We seek the kind understanding of Ms Mohan and other residents near the biking trail when mountain bikers get too carried away with cheering, after being flush with adrenaline from the exhilaration of clearing a highly technical climb. As the working committee of the Mountain Bike Association (Singapore), we also urge mountain bikers using the Bt Timah trail to be considerate to residents living nearby, and to observe proper trail etiquette including not littering, avoiding unnecessary shouting, and cycling only in the designated mountain biking trail.